Willapa National Wildlife Refuge. Photo by Jace Walker. Pacific County is home to the Willapa National Wildlife Refuge and five important bird areas recognized by Audubon. It’s an excellent location for birding, wildlife photography, and appreciating the wonders of the natural world. Noble Roosevelt elk, black bears, otters, beavers, and a host of other extraordinary creatures live throughout Pacific County. At the right time of year, you might spot the spouts of migrating whales or the sleek black and white of an orca just offshore. Always give wildlife plenty of space and never feed them. There are a number of protected species in the area, and there are laws in place to protect marine mammals. Stay at least 100 yards back from seal pups. If you see an injured or distressed marine mammal, contact the Marine Mammal Stranding Network at 206-526-6733 ext. 1 or local authorities at 360-642-3078. Cutthroat Climb trail. Photo by Sarah Day. Bald eagles dancing over Long Beach. Photo by Jace Walker. The Long Beach Peninsula is known for birding. More than 300 species of birds make their home here on the Peninsula. Whether you are searching for Great Blue Herons, Trumpeter Swans, the Western Screech-Owl, or perhaps the Red-Breasted Sapsucker – the possibilities are endless. 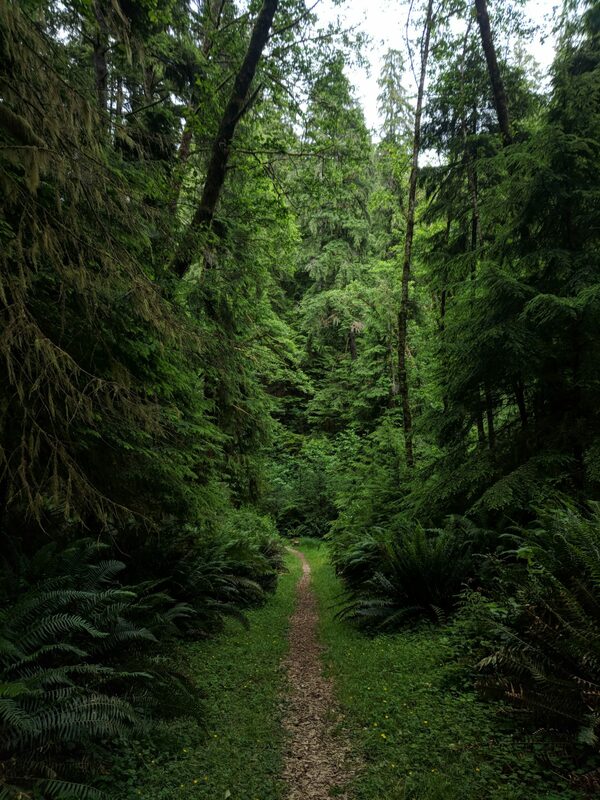 With several distinct eco-systems in this very corner of southwest Washington State, Pacific County includes Pacific Ocean seashore and marshland, lakes, inland waterways, wetlands, the Columbia River, and the Willapa Bay along with its many tributaries. Hundreds of species of birds migrate here each fall. Winter flocks consist mostly of Sanderlings, Dunlins, Black-Bellied Plovers and a few Western Sandpipers, and a spattering of Marbled Godwits. Peregrine Falcons are numerous and Merlins often sighted. In years’ past Snow Buntings have been seen at Leadbetter Point. Numerous sea ducks, grebes and loons can be observed along points on the Cape Disappointment State Park jetty, Coast Guard boat basin/launch and various points along Willapa Bay. Western Screech Owls and Great Horned Owls might be heard calling in the Seaview bluffs. Gulls are numerous, always with the chance of seeing an unusual species. Trumpeter Swans overwinter on Black Lake and Hines Marsh. Never chase or flush birds. Walk slowly and stay concealed. Great Horned Owl. Photo by Jace Walker. Whale watching is a year-round activity on the Long Beach Peninsula with Pacific Gray Whales being the most commonly seen species. While whale watching can be done year round, there are two times during the year that are prime for watching the biannual migration of nearly 20,000 Pacific Gray Whales. Each winter whales pass by the Peninsula after spending the summer feeding in the food-rich waters of the Arctic. Heading south along the Pacific coast to the bays of Baja California, where they mate and nurse their young in the warm lagoons. Early January is the peak of migration, but whales can be spotted mid-December through early February. The viewing platforms in and around the Lewis and Clark Interpretive Center and North Head Lighthouse offer the best viewing. Don’t forget your binoculars! Catch them on their way up north! The northward migrations begin mid-March. The immature whales, adult males and females without calves are the first to head north, passing the Peninsula in March and April. Later, females with calves come along at a slightly slower rate, passing the Washington coast in May. The best time to spot whales is in the early mornings hours when conditions are usually more favorable, depending on the weather. As you scan the horizon be sure to look for the blow, the whale’s vapor can blow up to 12 feet in the air when it exhales. Once you have spotted a blow, stay with it, as more are surely to follow. Head to our trails to fully appreciate the diverse habitats that attract our feathered friends. Here are 5 hikes to take for a great bird watching experience. The Long Beach Peninsula is an excellent location for those with a penchant for capturing wildlife on camera to practice their art and delight in the wonders of nature.